Author, geologist, visionary and channel James Tyberonn reviews activation of the Quantum Crystalline Field, the 144 Phi Grid and their role in the Planetary Ascension along with many other fascinating topics in his long awaited second book "Earth-Keeper Chronicles: METATRON SPEAKS". Ronna Herman, Author, Channel and Matriarch of the New Age Movement in America. 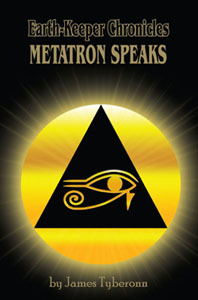 Read the inspiring and amazing channels of Archangel Metatron on: Planetary Grids, Reshel Grids, Vogel Phi Crystals, The Fall of Atlantis, Atlantean Master Crystals, MerKaBah and MerKiVah, Leylines, Sacred Sites, Sacred Waters, Healing Gems, Auric Maintenance, UFOs, Sasquatch, LeMuria, Hollow Earth, the Eagle and Condor, Earth Changes, Time Travel, Multidimensionality, Nonlinear Time, Reincarnation, Black Holes, White Holes, The Cosmic Trigger, Global Warming, Hologramic Dimensional Inserts and the Flashing Nature of the Universe.